Immigration Information New York City: Common Visas In The U.S.
For many decades, people have been flocking to the United States with hope in their hearts for a new life. Whether it was during the conception of this country with the pilgrims coming to start a new life free of religious persecution or in modern times, with varying people from different backgrounds searching for opportunity, America has been a country of aspiration and ambition. At Zohar Law PLLC, we want to be a source of immigration information to further your desire to come to this land of freedom and optimism. At our law firm, we can help you and your family apply for an immigrant or a nonimmigrant visa with our services. In today’s blog, we’ll be going over some of the more common types of visas in the U.S. These are the most popular types of visas that other immigrants are applying for. Our law firm will help you find the correct visa for your specific situation. At this time in the U.S., there are many debates about the policies for immigration. For further information on what’s going on in this country when it comes to immigration reform and policies, read What To Know About DACA and Why Is Immigration Such A Hot Topic? 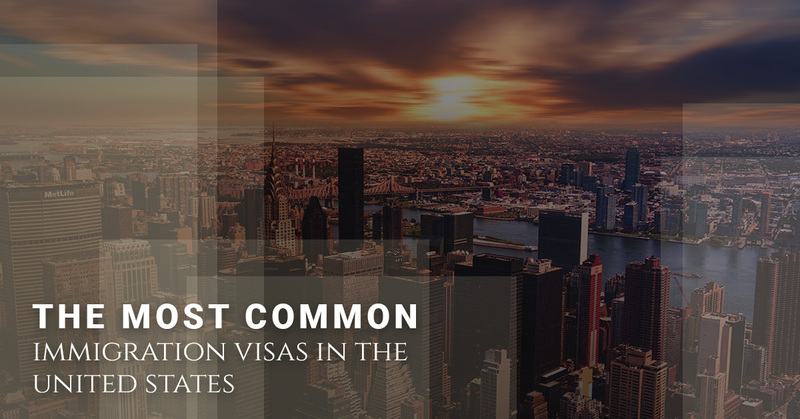 The first most common visa you can get in the U.S. is the H-1B visa. The H-1B visa is a type of nonimmigrant visa. This visa is for companies that are in the U.S. who would like to employ a worker in a specific field. This visa includes people who have Bachelor’s degrees or a higher education in a special occupation. You can apply for this visa to come to the U.S. to work for the company. As a nonimmigrant visa, it’s vital that you’re aware that it’s not a permanent stay in the country, but one where you can stay here temporarily as a noncitizen. People who have specialties in science, medicine, mathematics, accounting, finance, information technology, and engineering are able to get this visa. Another popular type of visa is the O-1 Visa. This visa is for people who are artists or performers who would like to come to America to perform their specialty. If you have an extraordinary ability in science, arts, business, education, athletics, acting, or who are internationally or nationally known for their talents, then you, your family, and anyone who else involved in what the performer does can apply for this visa. This type of visa is beneficial for everyone is involved in the process of the performance. The EB-5 visa is for entrepreneurs who want to bring over their spouses and any unmarried children to apply for a green card. This is an immigrant visa for those who want to come to the U.S. and create jobs. Specifically, if there’s an entrepreneur who wants to apply for a green card with their spouse and unmarried children, they have to invest in an American business and proceed to create at least 10 full-time permanent jobs for Americans or sustain 10 already created jobs. In addition, an investor has to invest a specific amount of money in an American company to apply for this visa. The E-2 visa is a type of visa that is only temporary. It’s a nonimmigrant visa, so you can only stay in the U.S. for a short amount of time before you have to return to your country of origin. This visa is for companies who want to do business overseas with a treaty country. For example, an American company can do business with Belgium or France because they are treaty countries. This visa allows you to conduct business without breaking any laws. Lastly, the F-1 visa is a visa for students who want to go to school full-time in the U.S. This visa is for those who want to go to an accredited college, seminary, academic elementary school, university, conservatory, or an academic high school. It is a beneficial visa for people who want to have an American education or a higher degree from an accredited university or college that they are unable to get at home. At Zohar Law PLLC, we strive to represent you and your family during your immigration case. The first step in the process of putting together a case is to consult with you on a one-on-one basis to create a personalized strategy for your situation. We’ll take into account the past and the present situations as well as figure out the best pathway for your specific situation. For further information or to schedule a consultation, fill out the form below.